The Gates Learjet 36A is a twin-engine executive jet aircraft for up to six passengers. William P. Lear, Sr. initiated in 1959 the development of the Lear Jet a small jet aircraft, based on the known structural quality of a Swiss strike-fighter, the FFA P.16. The Lear Jet Model accommodated two crewmembers and five passengers in its basic executive model. This Lear Jet Model 23 Continentals was the first small jet aircraft to enter mass production. Originally the Lear Jet had to be assembled by the Flug- und Fahrzeugwerke FFA AG in Altenrhein, Switzerland, from components manufactured there, in the U.S.A., Japan and elsewhere. Problems with suppliers and production tooling in Switzerland the European assembly plans having been abandoned in 1962. Lear compelled to shift assembly of the new aircraft to Wichita, Kansas, U.S.A. Nine months after work on the project had begun by Lear Jet Industries, the first prototype of this business transport, N801L, flew on 7 October 1963, from Wichita's Mid-Continent Airport. The original Learjet was destroyed in June 1964 when it crashed at takeoff with a Federal Aviation Administration pilot at the controls. The cause of the accident was determined to be pilot error—retraction of the jet's lift spoilers was overlooked. However, the second prototype and first production Learjet Model 23, N802L, flew first on 5 March 1964 and received formal FAA certification on 31 July 1964. The first delivery of a Learjet Model 23 was to Chemical and Industrial Corporation of Cincinnati, Ohio, USA was on 13 October 1964. As the private jet market became more competitive, Lear Jet had difficulties remaining profitable and substantial operating losses accumulated over the first few years of production. In 1967, the company was sold to Gates Rubber Company of Denver, Colorado, and renamed the Gates Learjet Corporation. The Learjet 35 is a stretched, turbofan powered development of the initial Learjet models, the 23, 24 and 25. The Learjet 36 is basically a Learjet 35 with increased range. This increase is possible through the removal of two seats for an extra fuel tank. The Learjet 36A is a further development and has upgraded engines and a higher maximum gross weight. The Learjet 36A accommodates a flight crew of two and main cabin seating for six passengers in a corporate configuration at a max. cruise speed of Mach 0.81/852 km/h. The economical cruise speed of the Learjet 36A is 774 km/h. The Learjet 36A was introduced in 1976, replacing the Learjet 36. Military versions of the Learjet 36A are the R-21A and the U-21A. The R-21A is a reconnaissance version equipped with a long-range oblique photography cameras, SLAR and a survellance camera system. The U-21A is a utility transport, training version.Gates Learjet produced the Learjet line until 1987 and since 1990, the jets have been produced by the Canadian corporation Bombardier under the name of Learjet, Inc. Developments out of the basic Learjet Model 23 which entered production with Lear Jet Industries and or Gates Learjet Corporation were the Models 24, 25, 25D, 28, 29, 31, 35 and 36. When Bombardier took over the Lear Jet production the Models 31, 35, 36 and derivates of these Models remained in production. Until 1994, when the production of the Model 36A ended, 64 Learjet 36 and Learjet 36A were built. Skyline Aviation B.V. is an aviation company and fixed base operator (FBO) that works for Army, Airforce and Marines. Skyline Aviation was established in 1990 and its head office is at Den Helder Airport in the Netherlands. Besides Target Tow missions for Navy, Skyline performs EW training missions for the Airforce and uses the L-39 Albatros for training of Forward Air Controllers (FAC) for the Army and Marines. Skyline Aviation operates one missionized Learjet 36A, one Beechcraft 200 King Air and several Aero L-39 Albatros military jet aircraft out of Den Helder-De Kooy and Groningen Airport Eelde. The Learjet and the Aero L-39V are used for Target Towing. The Learjet has an auxilary fuel tank for long endurance missions. Gates LearJet 36A N116MA is one of the Skyline Aviation' aircraft based at Groningen Airport Eelde. This 1977-built LearJet 36A c/n 36-029 was registered first HB-VFD (ex N79JS ntu) in Switzerland and was operated by ALG Aeroleasing SA. In 1985, the HB-VFD was transferred to John von Neumann, Geneve. In 1990, the aircraft was re-registered N116MA, with Mantab Aircraft Sales, Inc., Hollywood, Florida, USA. 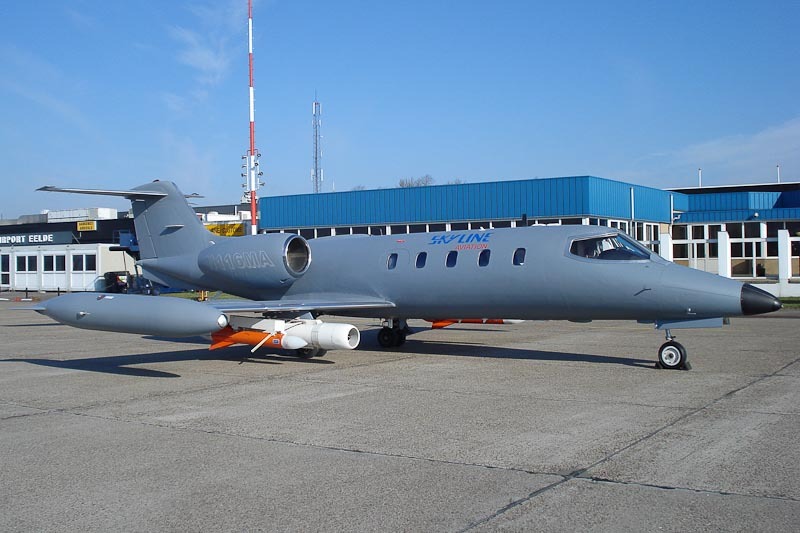 Learjet N116MA was transferred to Skyline Aviation and based at Valkenburg Naval Air Base. In December 2006, Valkenburg NAB closed and the Learjet was moved to Groningen Airport Eelde. However Skyline Aviation is the operator of Learjet N116MA, the aircraft is registered in the USA with Alexandair Inc., Wilmington, Delaware, as registered owner.